I am not going to have much time to write for the next few days, so I thought I'd better put up my Best New Year's wishes already. And now I'm going to go to sleep for the last time in 2009! And please remember: Don't drink and drive! 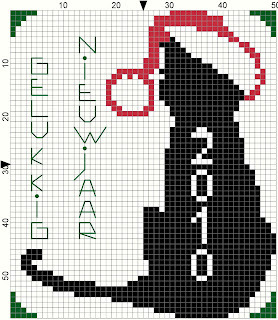 I still have to put up a link to the little "Thank You" cushion (in Dutch) I made december 23rd. You can see the picture of it in that post. You can make it to thank somebody because you received a nice Xmas present maybe?! I do hope you like it, and if you make it, please show it to me, I would really appreciate it a lot! Enjoy and thanks for your visit! I haven't stitched much the last couple of days. Understandable! It was Xmas after all! I've had some time to design some more freebies and I will put them on-line soon! I just want to put up a picture of the SAL I'm stitching. Part IV is finished and it's looking great! Even if I say so myself! Oohhh, yes!!! I got a beautiful Xmas pressie from my boyfriend's family! A really neat and big birds feeding house! Once it's up I'll take a picture of it! I'm really very happy with that present as I do like to see lots of birds in my garden and I'd like to attract sparrows. I don't know why, but when I was little, those were common garden birds, but nowadays they're hard to spot. I do hope this feeding house will change that and will become a popular restaurant in my garden with lots of birds. The text says "Thank You" in Dutch. I made this for my neighbour who looks after my cats when I'm on holidays. I will put up the link for the chart and key somewhere at the end of this week. I don't have enough time now, tomorrow I'm working and it's Christmas Eve, so I guess my blog will be left untouched for the next few days. But this freebie chart will be put up on here soon! The link is up as of now in the message I wrote December 30th! I noticed this afternoon there were some stitches missing in the biscornu I put up last sunday. I want to put the corrected file up this evening and now I can't get on the host where I store all my .pdf files on-line. The bleedin' thing says it can't log in as there are too many connections! Comme on people! DISCONNECT!!!! I need to get in. PLEASE!!! I must say it's not always fun to keep up a blog. I got completely stressed when I noticed the little mistake I made in the biscornu design and I will probably remain stressed untill I can correct it! I am even stressed writing here. Putting up smileys and such isn't that easy either. When I insert images, the HTML codes are inserted in the beginning of my text so I have to cut and paste a lot! Reminds me of a song from "The Stooges": "No Fun"! Anyways... to get on with it... I managed to make the "Biscornu design" I published here. When making it I realised it wasn't such a good design to make a Biscornu with, so I made it into a Christmas ornament. It's made on 14 count Lurex Aida, which isn't showing through in the pictures, which is too bad. Oh Bummer... I tried connecting to that host again.... still not working. I guess half of Europe is hosting pictures and whatever else on there. I really like things to be perfect, that's why I wanted to put up the correct version of the chart. In fact, I just forgot 4 stitches in the middle top of the design. When you stitch it, you will understand what I mean. Just 2 red stitches and 2 green stitches. I will try again tomorrow to put up the corrected chart. I also changed the name of the design. It is now officially called a Christmas ornament! 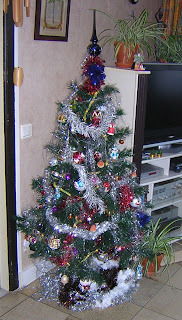 I managed to put up my Christmas tree yesterday. Just didn't feel like it earlier on. 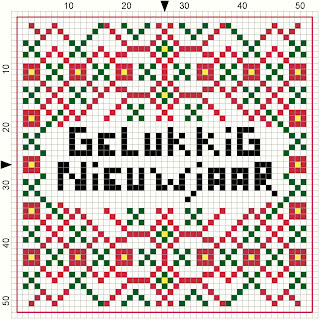 It has the Dutch text: "Happy New Year" on it, it's not a big design so you might have the time to stitch it before this year is finished. It could be a last minute pressie for a Dutch/Belgian (Flemish) friend or for yourself! Make sure to show me your finished design! I really like to see the work of fellow stitchers! Signing off for now as I'm going to continue to stitch my very first biscornu I designed. I will put up a link and everything else once it's finished! Thanks for your visit and I hope you have a nice sunday. What a day! It was boring at the office, people just don't die anymore these days, it seems.... so there's not much for us to do... (I take care of the administration of a graveyard, remember) I had made another cross stitch freebie yesterday evening and I tried to put it up this afternoon, but as I wasn't working on my own home computer, I couldn't. It has the Dutch text for "Happy New Year" written on it and it's free for anyone who wants it. I know I'm a bit late in putting these things on-line, and you might not have enough time to stitch it for this year's festive season, but you can always keep it for next year! Of course you will have to change "2010" to "2011", but that will not be too hard to do yourself. I hope you like it and if you stitch it, contact me so I can display your masterpiece on here! 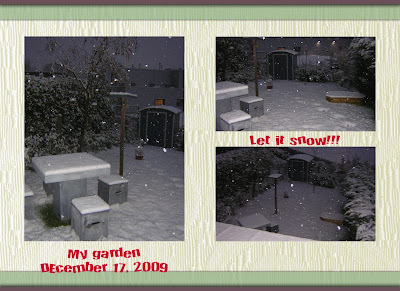 As for the rest of today.... Around 13PM it started snowing here and to my horror it didn't thaw immediately and it still isn't at this very moment, in fact, it's still snowing! Yes, you are right, nature does look lovely and fairytale like with a thick, white snow carpet but I dread it 100%. I drove home tonight and it's just as if Belgian drivers don't know how to drive anymore once they see some snow! Gawd, that snail's pace really irritated me! The main road was open so I don't see why everybody was driving at 5km/h?! But that's not the only reason why I don't like snow. The main reason is I get scared when walking through it. Scared to fall and break a leg, because if I break a leg, I will be "immobilized" as I can't use crutches. I've had a rather bad accident when I was 20 (I was run over by a car) and as a result I can't use my right arm very accurately anymore, so you can understand crutches are no option for me. That's all for now folks! Enjoy, have a nice evening and thanks for the visit! Just to mention I'm home and somebody helped me out with the hosting of the pdf file! Now it will stay on-line permanently! The only other things I'll do this evening is mimic a couch potato, watch some tv, eat a sandwich, do some cross stitching and phone my boyfriend using Skype. I am at work and as it got so late last night I feel as if my brains are still in my bed at home! Anyways, I think I found a way to get the .pdf file of my first cross stitch freebie into this blog, using a free PDF host. It's not completely satisfactory as I can only leave the file online for 30 days. But it will have to do for now! I do hope this is going to work and that you will be able to get the file! The link should be underneath here! Almost midnight here but I just wanted to publish a Xmas freebie I just made. It's not completely my own idea. I used PCStitch to make it. 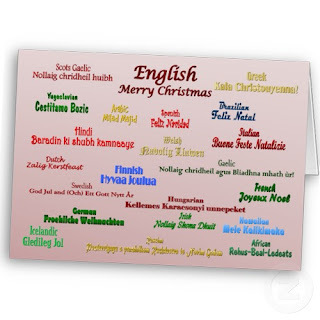 It says something like "season's greetings" but in Dutch. Almost all the cross stitch freebies I come accross are in either English or French. So I thought I'd make one for Dutch stitchers. 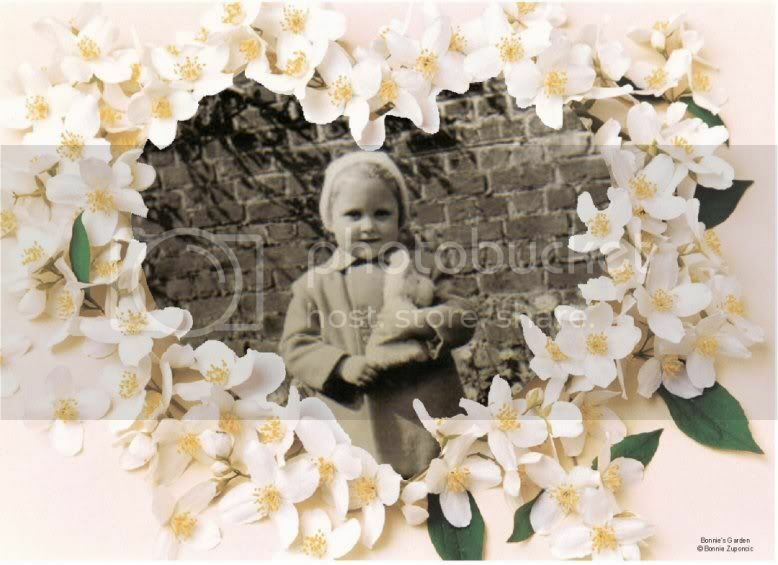 I hope you like it and if you stitch it I would be very pleased to see the result! Errrr.... right.... well... I'm not a computer wiz and it seems I have to figure out how to put up a link to the pdf file I created so you can download the chart and the key. I'm a bit sorry to have to let you wait for this until tomorrow evening as otherwise it will be waaaayyyy past my bedtime and I can't afford to get to work late tomorrow morning. But you can rest assured, your patience will be rewarded shortly. And... if you are wondering about how our trip to Oberhausen was, I can tell you it was fantabulous!!! I am more and more pleased with this SAL!!! It's not too difficult to make, although I must admit I made a wee little mistake in the last part, but it will have no impact on the next part of the SAL and if you don't know it, you will not notice it. The reason I stitched this part rather fast is, my boyfriend and I are leaving for Germany tomorrow morning. We are going to go Xmas shopping in Oberhausen. We will be back friday evening, but I still need to do some more Xmas stitching and decorating so I wanted to finish this SAL first. So, this is the 3rd part of my first ever SAL. I am enjoying it so much I can already mention I have a new SAL that has drawn my attention. The new one will start next month and consists of making a biscornu for each month of the year. I am a bit of a biscornu addict, so I really want to start with that SAL as well. I do hope I'll have the time though! But I am 100% sure my present SAL will be cherished for a very long time to come! It's already almost 22:30h. Going to stop writing now as I have to do some more stuff before going to bed in a bit! If anyone wants to leave some comment, please do! 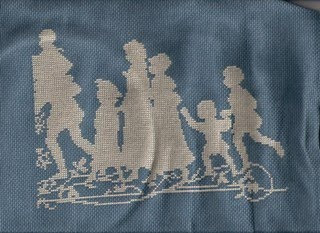 I do like to read reactions on my stitchings and other things you can find on my blog.